One day when the disciples and Jesus were leaving the Jewish temple, one of His disciples pointed out how magnificent it was. But unimpressed, Jesus began to tell his disciples that one day the temple and all the sacred buildings surrounding it would be destroyed. In the same way, a Samaritan woman pointed out to Jesus there was only one special place in which to worship, at which the Lord responded, it was not where one worshipped but how one worships that concerns God, and the time was coming when “True” worshippers would worship in “Spirit and Truth”.- the way His Father desires. Recently, I had the opportunity to visit the beautiful country of Germany, and situated in the city of Trier was a beautiful Cathedral adorn with many carvings and images. The high majestic ceilings and the spiritual images were impressive and there was a quiet form of worship taking place as people gazed upon the intricate carvings.. But what came to my mind was what Jesus said about the magnificent temple in His day and His explanation of true worship. Then it occurred to me that He does not desire buildings of mortar or gold in which to dwell, but rather it is within our hearts where He is truly worshipped and adored. Neither is there any sacrifice or work that pleases Him, such as erecting a building in His Name, or carving out spiritual images which He has *forbidden. The only thing He desires to be lifted up is the gospel message of Christ’s death and resurrection, as He was lifted up on the cross- bringing salvation to all mankind- and lifted from the earth signifying eternal life in Him. Then I saw a small chapel created within the cathedral in homage to Mary, Christ’s earthly mother. I was saddened concerning this, knowing that only God the Father deserves our worship and recognition through His Son, Jesus Christ. Even Jesus pointed this out when a woman sought to bring homage to Mary while He was pouring out from His bosom the Truth concerning God. Only Jesus Christ deserves our complete devotion. So how does God desire worship? He wants us to worship Him first by knowing the Truth concerning His only salvation through the sacrifice of His Only Begotten Son, Jesus Christ. Then, by knowing and accepting the Truth-, repent of our sins and receive His indwelling Spirit where we become His Holy Temple and dwelling place forever. This entry was posted in Current Events, Faith Messages and tagged "If I be lifted up". Holy Spirit, 1 Corinthians 6: 19-20, 2 Corinthians 1: 21-22 Luke 11: 27-28, death and resurrection, Germany, God, gospel, Jesus Christ, John 4: 20-24, Mark 13: 1-3, Mark 3: 32-34. 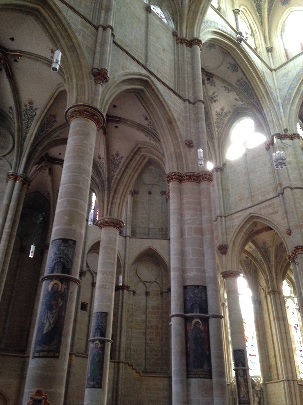 Matthew 10:37, Mary, Revelations 21:3, Samaritan Woman, Spirit, St. Peter's Cathedral, temple, Trier, true worship, truth. Bookmark the permalink.